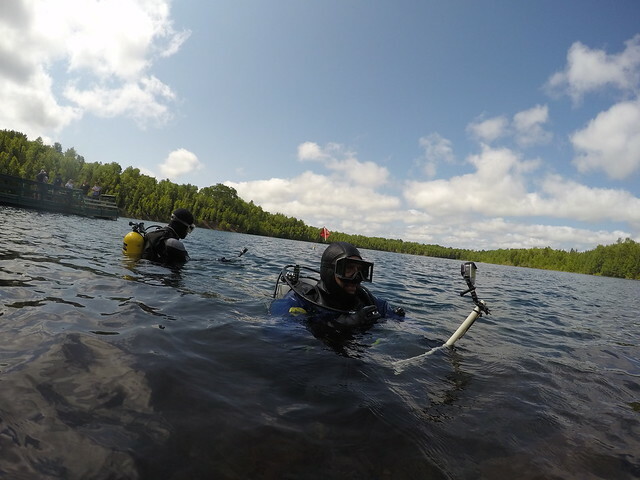 Come and join us vintage divers at Fortune Pond in Michigan August 2nd through August 4th. I will be there already in the afternoon of August 2nd while most will be there August 3rd and 4th. - The regular motel (Lakeshore) was full up 2 weeks ago. Jill and I got a room. So did Sheriff diver Ron and SwimJim. Brian Frogman63 and his wife will be at the AmericInn. Ron says he has a couple other friends that may be coming, too. Hope DiverDon can come down and dive a little with us. I hear he has a new compressor and I'd sure like to see it. - I'll be bringing my UV26 scooter and am looking forward to showing Jill the underwater cliffs in a fly-by tour. I'm going to only bring one set of 38s this time and refill them from higher pressure 80s. That'll take less space than bringing 5 sets of twin tanks! - Jill and I will be arriving at Fortune a little before noon on Friday. 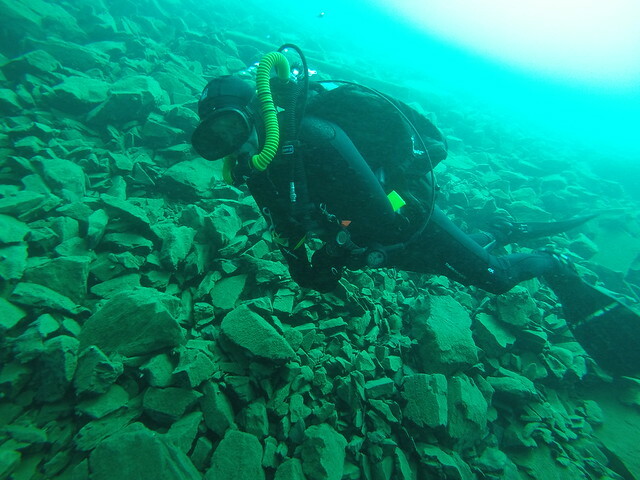 Probably make 2-3 dives Friday and 2 dives Saturday before heading home. Jake! Elwood!, do you see the light???? I vote for the yellow ones Eben. They show up better on pictures... 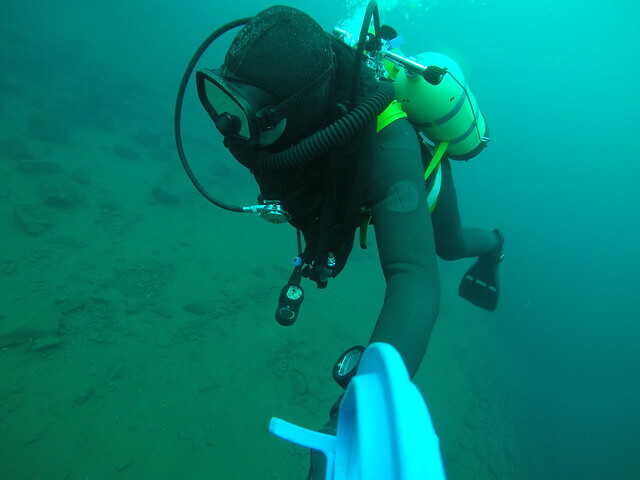 Think of how bright my striped wetsuit looks underwater especially with the UDS-1 triple unit. 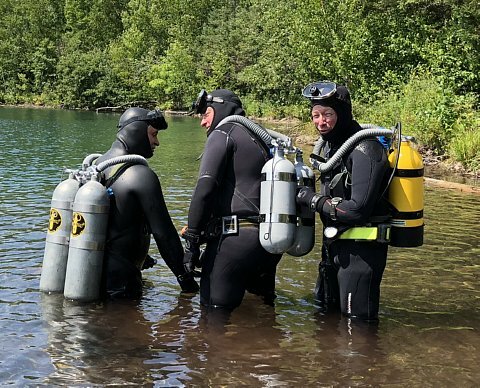 For wetsuits I will have my silver wetsuit, my US Divers 1974 wetsuit, my smooth skin yellow striped wetsuit, a sharkskin wetsuit and a modern US Divers 3mm wetsuit. 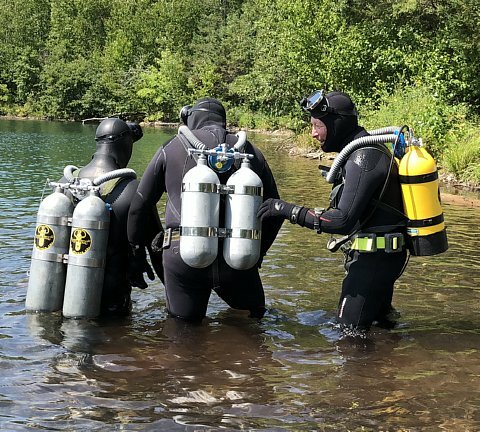 - The marketers of scuba tanks were notorious for using the "10% Overfill" volumes in their advertising. And the 38/42 tanks were no exception. 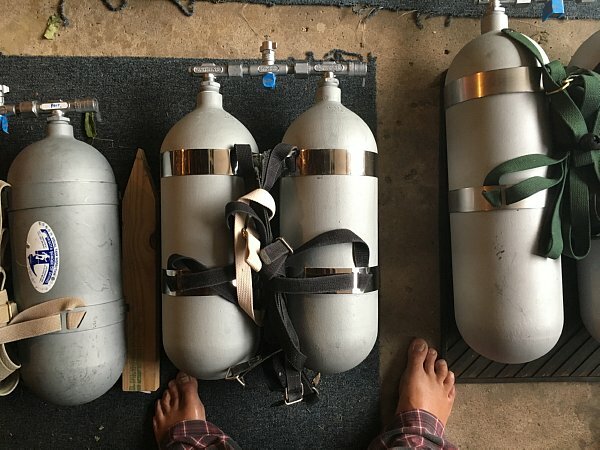 My US Divers set is 1800 psi and originally advertised as Twin 38s. Sportsways came out with their small tanks which are 1880 psi. But they advertised them as 42s because when you fill 1880psi to 10% over, you get 41.8 cf. So the next year, USD changed the ads on the 1800 psi Twin 38s and called them 42s... Because when you fill them 10% over, you get 41.8 cf. - And then there are the Surplus 1800 psi 38s with valve bushings... They have the nicest round bottoms! 10% over on them also gives you 41.8 cf. - So whether you see them referred to as "Double 42s" or "Twin 38s", they are the same volume. 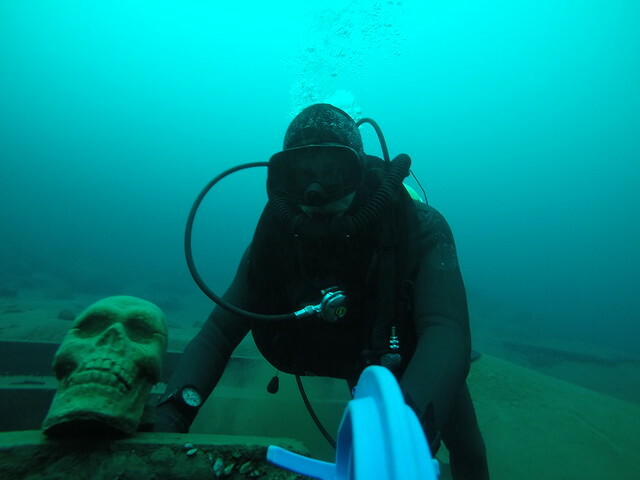 Selfie with skull at 81 feet wearing my sharkskin wetsuit. Our Voit 50 Fathom theme dive. Eben, Brian and I were all wearing different Voit 50 Fathom double hose regulators. 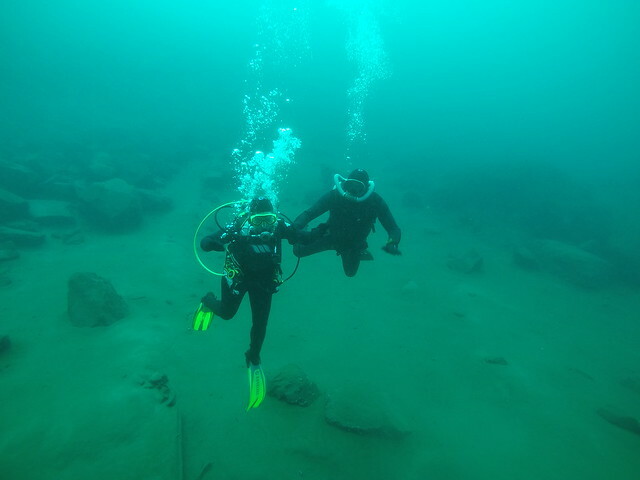 - We did a full vintage theme dive with three types of Pacifica Masks and three types of Voit 50 Fathom regs. Brian Frogman63 had an original Pacifica Mask and plastic body 50 Fathom. I had a modern Kinugawa reproduction Pacifica and a Blue Painted metal body 50 Fathom. And Ron Sheriffdiver had a more modern Pacifica mask and chrome body 50 Fathom. - Pretty slick twin tanks all around... If I do say so myself! - Three different models of Voit 50 Fathom regulators! 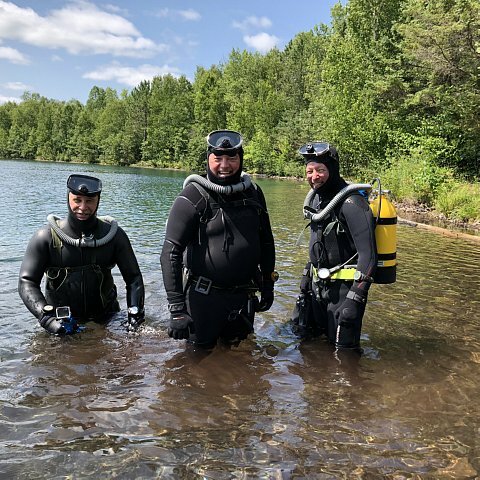 - I gotta say we really appreciate Brian Frogman63 and Janet traveling all the way over to dive with us at Fortune. What a great couple of friends that we first met at Sea Hunt Forever. After diving with Brian these two days, I have to say he is a super well put together diver. All of his equipment is attached and positioned in a well thought out and efficient manner. Underwater he is downright graceful! Above water, he is a Sea Hunt Mike Nelson NUT. As I was leaving the parking lot, he stopped me and said, "Stay tuned for the next episode of Sea Hunt!" - Also many thanks to Ron Sheriffdiver! Ron got to Fortune a day early and early each morning, too. He set up his Awning and Chile cooker, filled tanks, brought just about every piece of dive gear he owns, and dove at least 4 times a day! He is a super enthusiastic and super generous Vintage diving MACHINE! 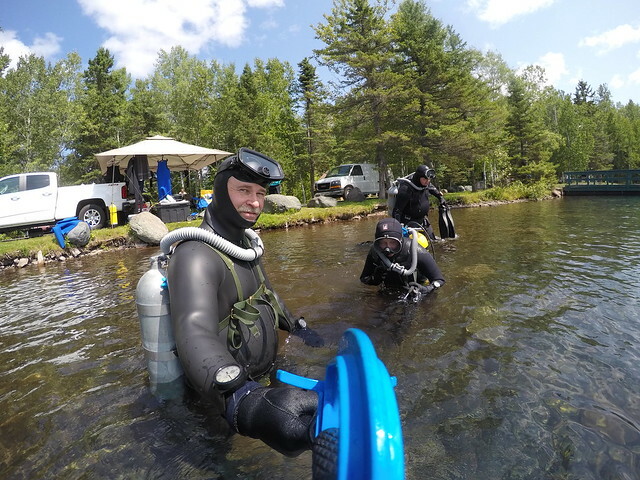 Thanks for all you do to make these dives great! 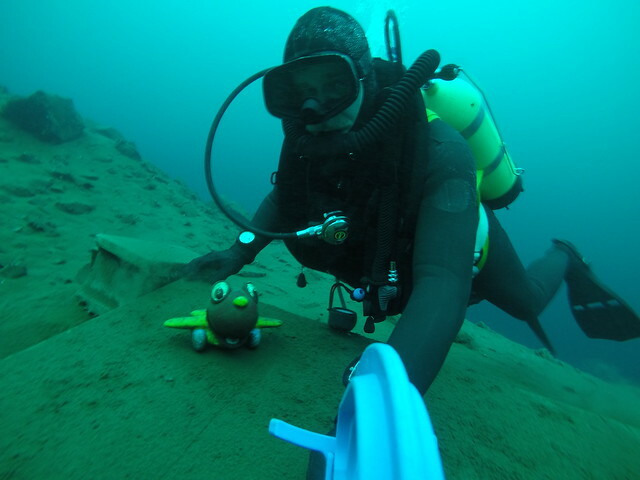 - We had a pretty good turnout: Diver Don made it over for Friday and brought a friend named "Bram". My wife Jill came with me. Brian and Janet. SwimJim came with his wife ViAnn. And Rons friends Jordi and Jess came for Friday and Saturday. That's 11 of us. - Lots of good vintage equipment and other items of interest. DiverDon brought his recently acquired Bauer Purus compressor for show and tell... Very cool. SwimJim brought a new old Voit Trieste and Divair and dove them both. Of course Ron had UDS-1s and other stuff. DiverDon brought and dove an ABS Triple set. Ah but I digress... It really was a great trip in both the diving and friendly conversations. - Next Trip is mid to late September. Dates to be announced. As Brian says, "Stay Tuned for our Next Sea Hunt adventure!" Note: Photos by Jill... Thanks Babe!